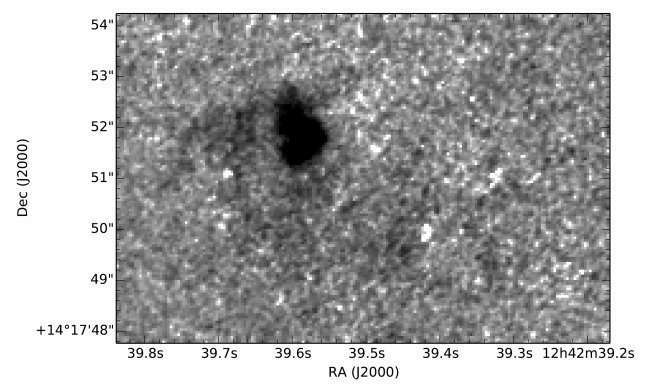 Hα image of the dwarf galaxy candidate. Credit: Stein et al., 2018. European astronomers have recently conducted a study of a star-forming dwarf galaxy candidate located in the halo of the galaxy NGC 4634. The new research, presented in a paper published August 8 on the arXiv pre-print server, provides insights into the nature and origin of this peculiar object. Located around 62.3 million light years away from the Earth, the spiral galaxy NGC 4634 is a member of the Virgo Cluster. It has the dynamical galaxy mass of about 27 billion solar masses and exhibits an enhanced star-forming activity. Its halo shows diffuse X-ray emission and has a bright diffuse ionized gas component. In 2008, a dwarf galaxy candidate was found by astronomers in the halo of NGC 4634, some 4,600 light years from the spiral galaxy's midplane. First observations of this object revealed that it could be a star-forming, gas-rich dwarf irregular galaxy that has been tidally disrupted by the gravitational forces of NGC 4634. However, more studies of this candidate were required in order to determine its real nature. Now, new research conducted by a team of scientists led by Yelena Stein of the Observatory of Strasbourg, France, reveals more details about the nature of the peculiar object in NGC 4634's halo. The study is based on analysis of spectroscopic data collected by the Hubble Space Telescope (HST), Giant Metrewave Radio Telescope (GMRT), and European Southern Observatory's (ESO) 3.6 m Telescope, as well as photometry from the Sloan Digital Sky Survey (SDSS) and the Galaxy Evolution Explorer (GALEX) database. "In this paper, we present multi-frequency data of a dwarf galaxy candidate and its edge-on host NGC 4634," the researchers wrote in the paper. According to the study, the images of r-band, B-band, and the hydrogen-alpha luminosity show that the dwarf galaxy candidate is approximately 1,800 light years in diameter and confirm its star-forming activity. The researchers detected a high oxygen abundance of the dwarf galaxy candidate, which suggests that it was formed from pre-enriched material. They added that the material from which the dwarf galaxy candidate was created came from the disk of NGC 4634, or is at least equally chemically enriched. Furthermore, the study reveals that heliocentric velocities of the dwarf galaxy candidate and its host are similar, indicating that they are connected. The results of their research confirm that the halo of NGC 4634 contains a star-forming object of significant size that is formed from gas stripped from the spiral galaxy. This, according to the authors of the paper, makes NGC 4634 an excellent laboratory to study galaxy evolution. The researchers noted that the most plausible hypothesis explaining the origin of the star-forming object is the tidal dwarf scenario, in which the candidate formed in the spur of NGC 4634 from disk material. However, further observations are needed in order to determine whether this peculiar object is a dwarf galaxy or just a star-forming patch. The halos of disk galaxies form a crucial connection between the galaxy disk and the intergalactic medium. Massive stars, HII regions, or dwarf galaxies located in the halos of galaxies are potential tracers of recent accretion and/or outflows of gas, and are additional contributors to the photon field and the gas phase metallicity. We investigate the nature and origin of a star-forming dwarf galaxy candidate located in the halo of the edge-on Virgo galaxy NGC 4634 with a projected distance of 1.4 kpc and a Hα star formation rate of ∼4.7×10−3M⊙yr−1 in order to increase our understanding of these disk-halo processes. With optical long-slit spectra we measured fluxes of optical nebula emission lines to derive the oxygen abundance 12 + log(O/H) of an HII region in the disk of NGC 4634 and in the star-forming dwarf galaxy candidate. Abundances derived from optical long-slit data and from Hubble Space Telescope (HST) r-band data, Hα data, Giant Metrewave Radio Telescope (GMRT) HI data, and photometry of SDSS and GALEX data were used for further analysis. With additional probes of the luminosity-metallicity relation in the B-band from the Hα-luminosity, the HI map, and the relative velocities, we are able to constrain a possible origin of the dwarf galaxy candidate. The high oxygen abundance (12 + log(O/H) ≈ 8.72) of the dwarf galaxy candidate leads to the conclusion that it was formed from pre-enriched material. Analysis of auxiliary data shows that the dwarf galaxy candidate is composed of material originating from NGC 4634. We cannot determine whether this material has been ejected tidally or through other processes, which makes the system highly interesting for follow up observations.